If you were to poll a group of random airline pilots about their salaries, you’d get a surprisingly vast range of numbers, and statistics with the U.S. Bureau of Labor Statistics bears that out. While the median salary for commercial pilots was about $78,000 as of 2017, the lowest 10 percent were earning less than $43,000, while the top 10 percent were earning more than $152,000. But interestingly, while airline pilot salaries vary wildly, they are pretty straightforward. So why the huge variation in pay between airline to airline or pilot to pilot when all pilots have to meet the same stringent requirements? That answer is that pilots are paid based on different factors. Similar to a U.S. military pay scale, pilot pay is dependent on many things, like how long a pilot has been with a company, whether the pilot works for a regional airline or a major airline, the region or country in which the pilot works, his or her seniority, and whether he or she is a first officer or a captain. And let’s not forget the state of the aviation industry in general. Pilot pay is also linked to global economic health. The aviation industry is a cyclical industry. It goes up and down just like any other, but the very interesting thing about airline travel is that it’s both widely dependent on the economy and it acts as an independent economic force throughout the world. Aviation—specifically air travel—changes along with the global economic climate, but it also provides secondary economic benefits to other industries, like tourism and manufacturing. A change in one can affect the other. As of 2018, the air travel industry is healthy. After the economic recession in the early 2000s, airlines seem to be in a period of growth, especially in Asia. This means that airlines are hiring pilots again after years and years of instability resulting in airline mergers, bankruptcies, and employee furloughs. 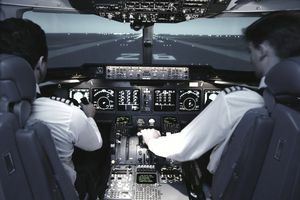 Pilot hiring has reached a peak, and airlines are finding that they need to be competitive with their compensation and benefits offered to pilots, and subsequently keep them from moving on to other airlines, increasing pay and benefits for pilots. In 2018, Envoy Air announced a $45,000 signing bonus for qualifying pilots who joined the airline. As such, pilot salaries have increased along with the strengthening economy, and they are expected to continue to increase in the future. But the airline industry is volatile, and in time, pilot hiring will slow again, and ultimately stop, and furloughs will be necessary for airlines to keep operating. During these inevitable times, airline pilot jobs are in demand and airline pilot salaries suffer. In general, just like most industries, an inexperienced airline pilot just starting out in the industry will make much less than a pilot who has been flying for 10 or 20 years at the same airline. But there are other factors, as well. Regional vs major airlines: In the air travel world, there are many types of airlines. There are regional airlines, low-cost carriers, national carriers, major airlines, and legacy airlines. The pilot salaries at each of these categories, and even within them, can be vastly different. A regional airline like Cape Air, which flies routes in smaller airplanes like the Cessna 402 and the ATR42 from the East Coast and in the Pacific, pays a first-year first officer (FO) in the C-402 less than $20/hour, as of 2018, while some other regional airlines will pay first-year FOs as much as four times that. Jump up to a major legacy carrier like Delta or Alaska Airlines, and you’ll see pay scales climb sharply. First Officer vs Captain: Remember that FO at Cape Air who makes less than $20/hour his first year? Well, compare that to a first-year captain at the same company, who might make triple that. The differences at other airlines are similar. Time at a company: Airline pilot pay scales often are determined by seniority and years at the company, so a pilot in his or her 10th year at a company will make significantly more than one in his or her second year. Monthly minimum hours: Monthly minimum hours at each airline are another factor that impacts annual salary. One airline might guarantee only 50 hours per month, while another will guarantee 80 hours of pay per month. When a pilot first starts at an airline, he’s usually on “reserve” status for a period of time. This requires a pilot to be on call either at the airport or within a certain range of the airport. He may find out he’s flying a few nights before a trip is assigned or a few hours before. During this period, a pilot might be paid differently. Also, pilots earn per diem while on trips, and different airlines have different per diem rates and have different rules for per diem. When considering pilot pay and benefits, a pilot's quality of life also is an important consideration. As one of the benefits at an airline, a pilot may receive bonus pay, paid time off, vacation time, paternity or maternity leave, and other various benefits. A pilot also must consider how many nights he’ll be away from home, how many hours he’ll be required to work, and even the types of hotels and food offered while traveling. Jump-seat privileges are also a consideration, as some airline jobs offer privileges on many other airlines, while others don’t offer these privileges at all. Paying to commute to your job can be costly. For all of these reasons, a pilot might report making $25,000 per year or $225,000 per year. But in general, newly trained, inexperienced pilots might make between $30,000 and $50,000 per year, while an experienced pilot who has climbed his way up from first officer at a regional airline to first officer at a major airline and then finally, a captain at a major airline over a period of 10 years will probably earn $100,000 or more.